There are some items a woman just needs in her closet! A basic white tee and a pair of black jeans definitely fall into that category. In this spotlight, we’re going to show you how to dress them up and down. With a few minimal changes, these items can be totally transformed! Get the Look: Julia is wearing the Mid Range Tee (White, S), Rock Culture Denim (Black Denim, 27), Sea, Sun & Sand Sunglasses (Black), All Around Town Handbag (Black), Believe Bracelet (White and Gold). Keep your eyes out for items that will be going on presale soon! Something as simple as adding a statement necklace can take your look to another level. Accessories are a must when dressing up basics! Adding a little sparkle and shine is always a good idea. 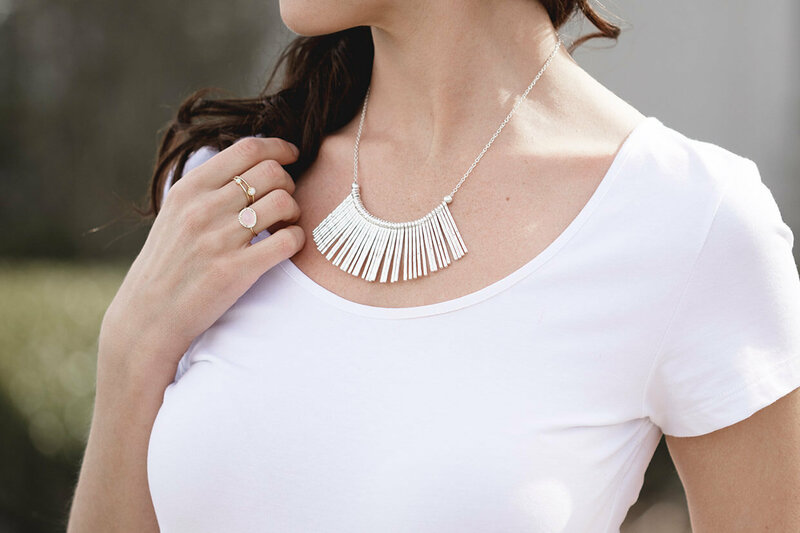 Get the Look: Julia is wearing the Mid Range Tee (White, S), Inner Shine Necklace (Silver). Keep your eyes out for items that will be going on presale soon! A crisp white tee can be the beginning to any outfit! It can stand up to patterned shorts, or bright coloured denim. Versatile and clean, a white tee is a wardrobe must! 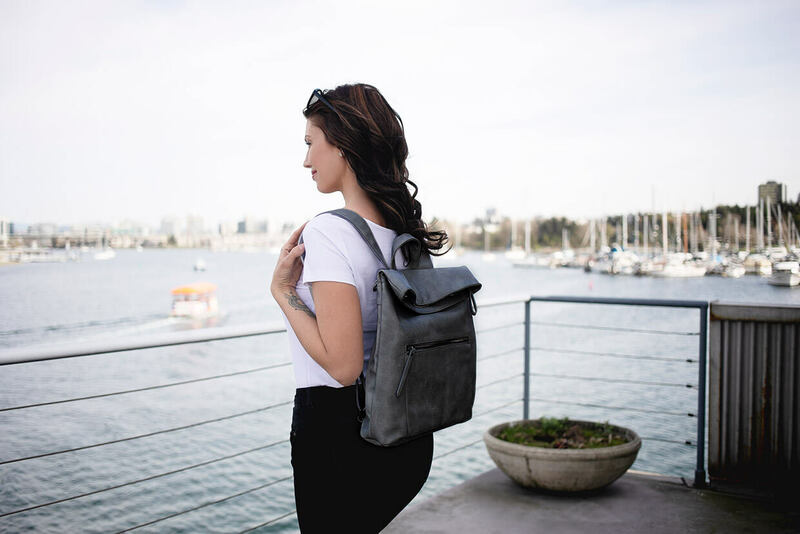 Get the Look: Julia is wearing the Mid Range Tee (White, S), Rock Culture Denim (Black Denim, 27), Journey Backpack (Light Grey), Sea, Sun & Sand Sunglasses (Black). Denim that goes out of style? Never! A little distressing adds some edge to your look yet still remains classic. Black jeans are truly classic. They look great on every shape and can be worn through every season. Get the Look: Julia is wearing the Mid Range Tee (White, S), Rock Culture Denim (Black Denim, 27), Believe Bracelet (White and Gold). Keep your eyes out for items that will be going on presale soon! A white tee and black denim can truly take you anywhere from a casual girl’s night out to a dinner party with friends. Whether you’re keeping it casual or dressing it up, these pieces are timeless classics. 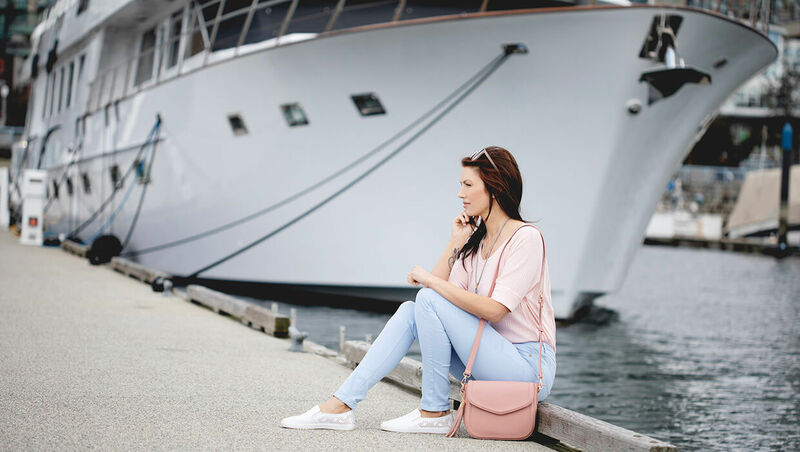 Get the Look: Julia is wearing the Mid Range Tee (White, S), Rock Culture Denim (Black Denim, 27), Sea, Sun & Sand Sunglasses (Black), Journey Backpack (Light Grey), One Step Ahead Sneaker (White, 38). Keep your eyes out for items that will be going on presale soon! You’re now officially ready to get back to basics! These two iconic items will never go out of style so now is the perfect time to freshen up your current classic white tee and black denim. Get the Look: Julia is wearing the Mid Range Tee (White, S), Sea, Sun & Sand Sunglasses (Black). Keep your eyes out for items that will be going on presale soon!